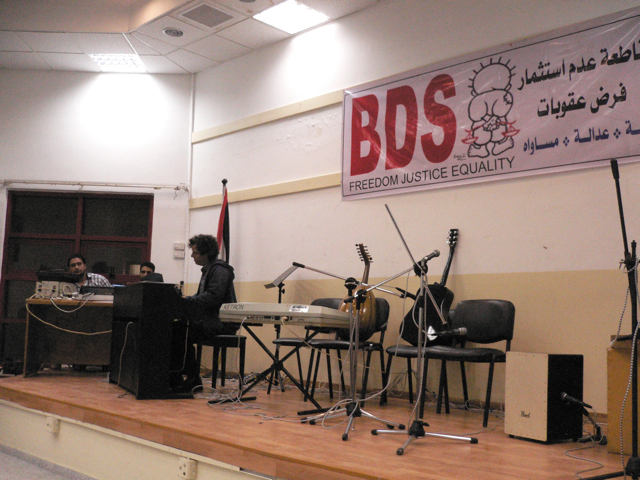 This blog is called “Music 4 Gaza”, as it all started with a benefit concert for the Music School in Gaza. 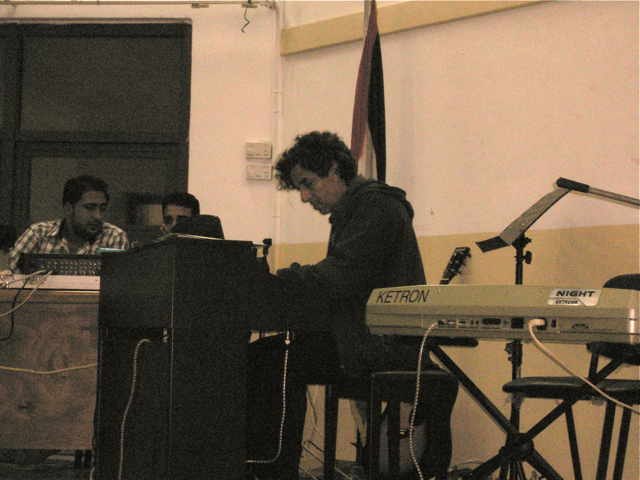 I have not yet visited the school, but Antoine was invited by Mr. Ibrahim El-Najjar, the director of the school, to practice piano for his recital there. He also handed over the items we were able to purchase and bring, due to the funds and donations collected during the concert. This consisted of sheet music of various types (as requested by the school), strings for violin, cello, and guitar, and a bunch of recorder flutes (donated by M. D’amour in Montreal). Tonight Antoine gives the concert. We are lucky that it can happen, as the day before he was sick and spent the day in his room close to the bathroom. The third (or fourth?) victim of a bug among our group. I seem to have been spared so far (fingers crossed). The hazards of traveling and eating in regions to which one’s immune system is not accustomed. The concert is an informal but jolly affair, where Antoine, characteristically, recounts anecdotes and gives explanations in-between pieces of piano and a song adaptation of Woody Guthrie’s ‘I’ve Got No Home In This World Anymore’. 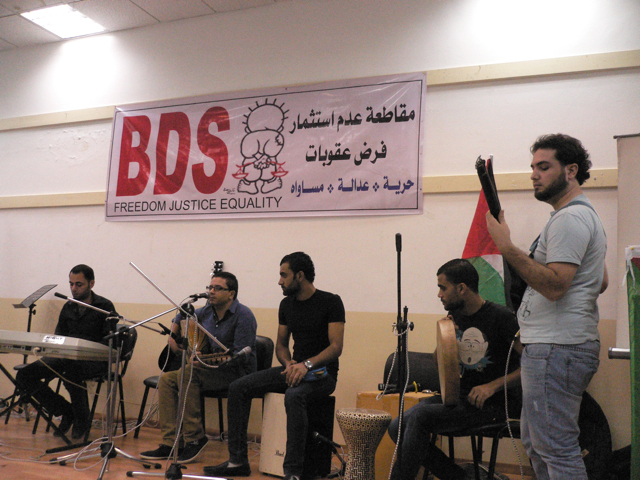 A local group takes the stage afterward and gets the hall swinging with Palestinian folk music. 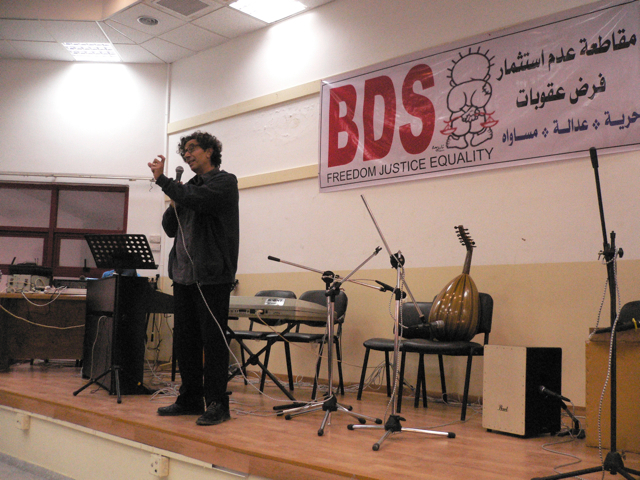 The singer and oud player, Mohammed Akila, has a stunningly beautiful voice that can start very deep and rise to higher registers characteristic of Arabic singing. 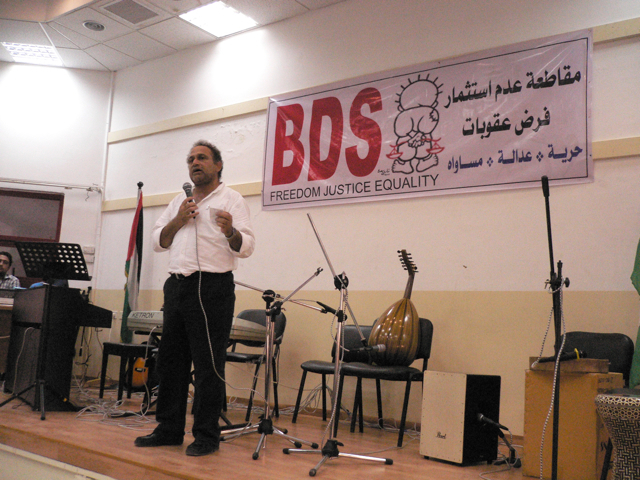 The event is organised by Haidar Eid, a professor of cultural studies at Al Aqsa and a BDS activist, with help from Ayah (and perhaps others I am not aware of). Most of the audience are young, mixed, and there seem to be no “beards”. Some of the young women I met at IUG have come. I greet them but as there is little time before the concert I say to them we’ll speak later. But at some point I notice that they have all left. Apparently, I am told, women, unaccompanied, and especially young women, must be off the streets and at home by sundown. We now understand why the concert has been scheduled for 4 p.m. in the afternoon. 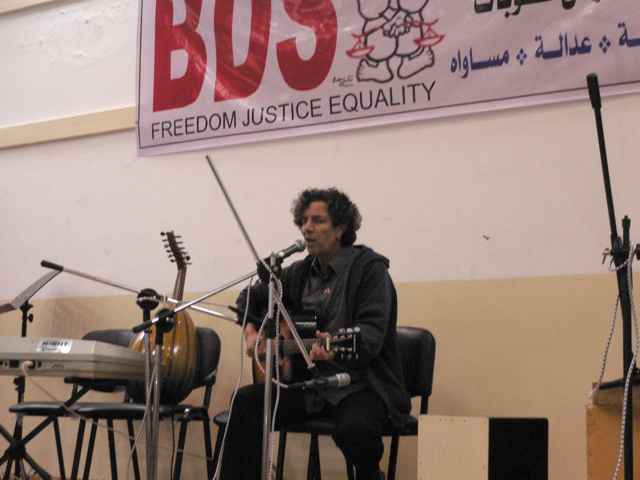 This entry was posted in Concerts, Visiting Gaza. ← On the street – enfin!